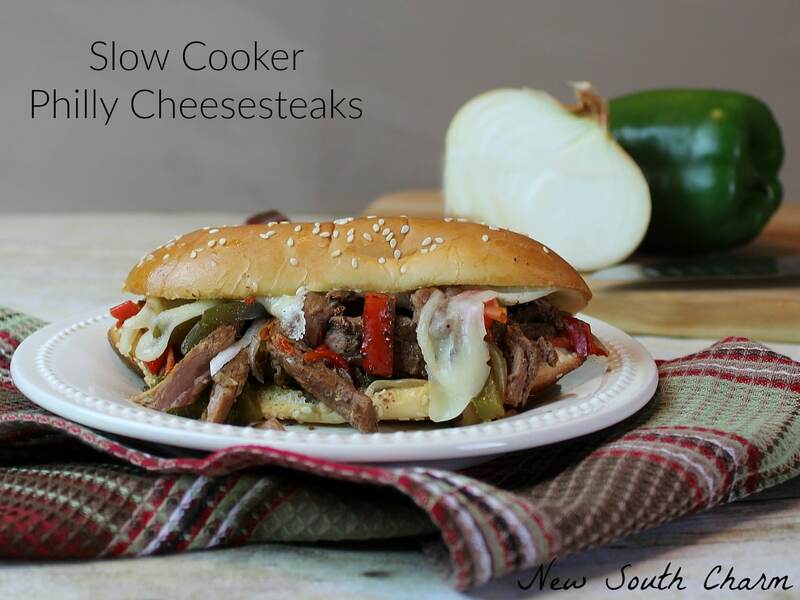 Don’t put your slow cooker away just because the weather is warmer. 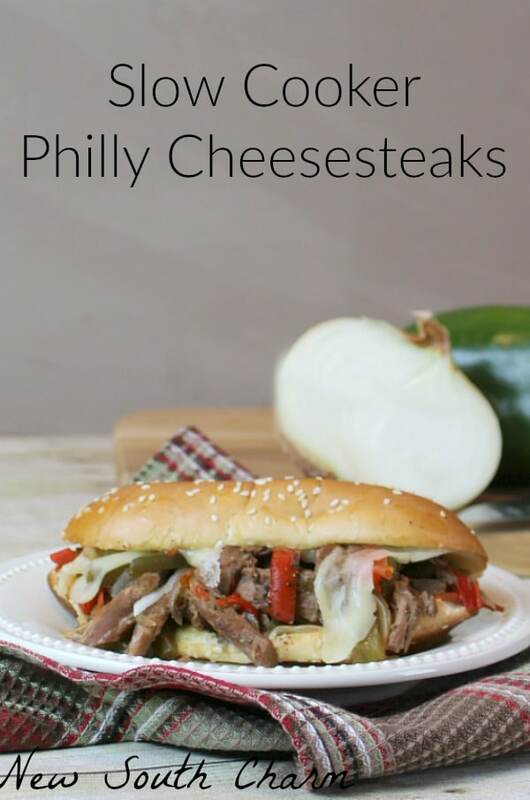 Use it to make these great Slow Cooker Philly Cheesesteaks. It’s really no secret that my slow cooker is my favorite appliance. I mean how could you not love an appliance that makes life so easy? 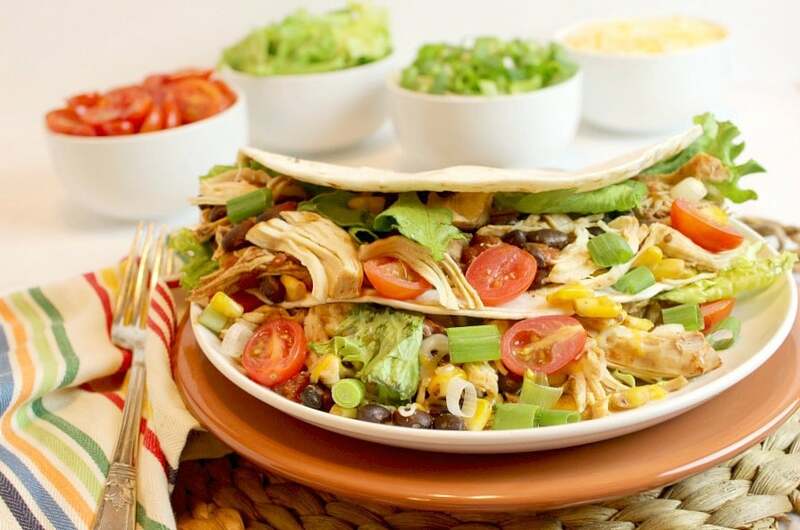 Add in how simple this recipe is and you’ve got a perfect 10! 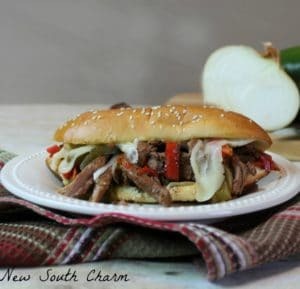 I made this recipe with flank steak. As a general rule the flank cut is pretty tough. That’s not the case here because you will slow cook the meat. Cooking it on a low constant heat for a long period of time will make the meat tender. So, don’t worry about the meat being tough by the time if comes out of the slow cooker it will be fork tender. I asked at the meat counter if I could have the steak cut into one inch strips. This saved me a ton of time. At my local grocery store they will always special cut things for you. If they say it take a few minutes I just do the rest of my shopping and stop by on my way to the checkout. In the bowl of your slow cooker stir together beef broth, Paprika, garlic powder, Italian seasoning, salt and pepper. Add the steak to the broth mixture. Make sure all the meat is covered by the liquid. Next, add in the sliced onions and bell peppers. Cover and cook on high for six hours. Before serving I like to stick the buns in a 400º oven to warm them and melt the cheese. 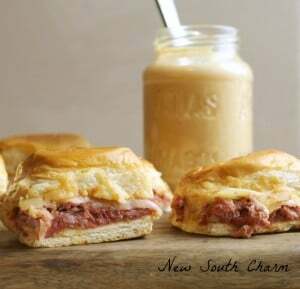 Once the bread is warm and the cheese all gooey layer on the beef mixture. I recommend using tongs or a slotted spoon to drain away the liquid. These are great with a salad or chips, or sweet potato fries. In the bowl of your slow cooker stir together beef broth, salt, paprika, garlic powder, Italian seasoning, salt and pepper. Add the beef to crock pot and make it’s covered by broth mixture. Top with onions and bell peppers and cover. Cook for six hours on high. 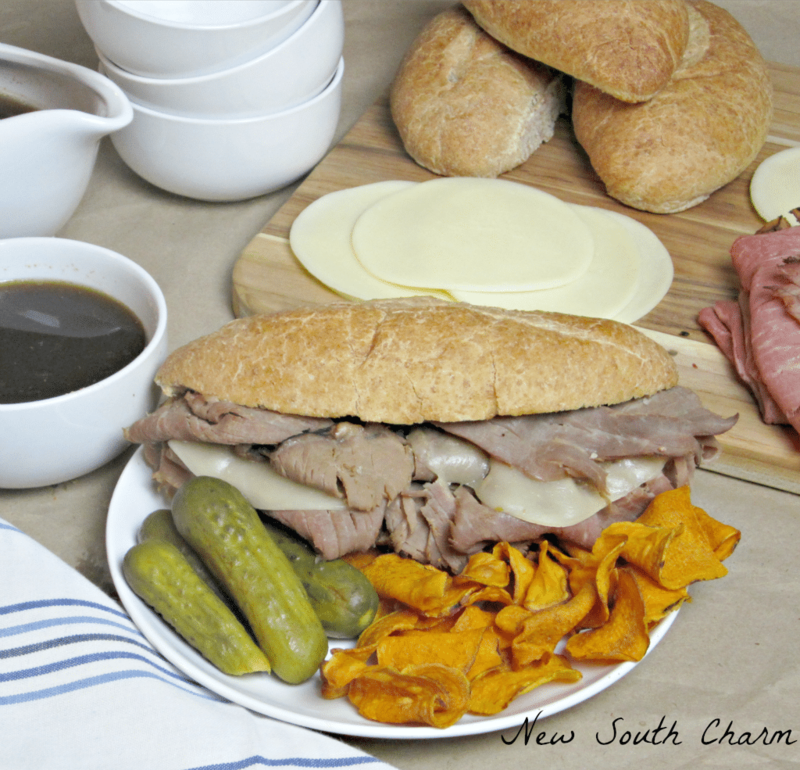 Before serving place open hoagie rolls on a cook sheet and layer two slice of cheese on each roll. Bake at 400º for about five minutes or until the cheese is melted. 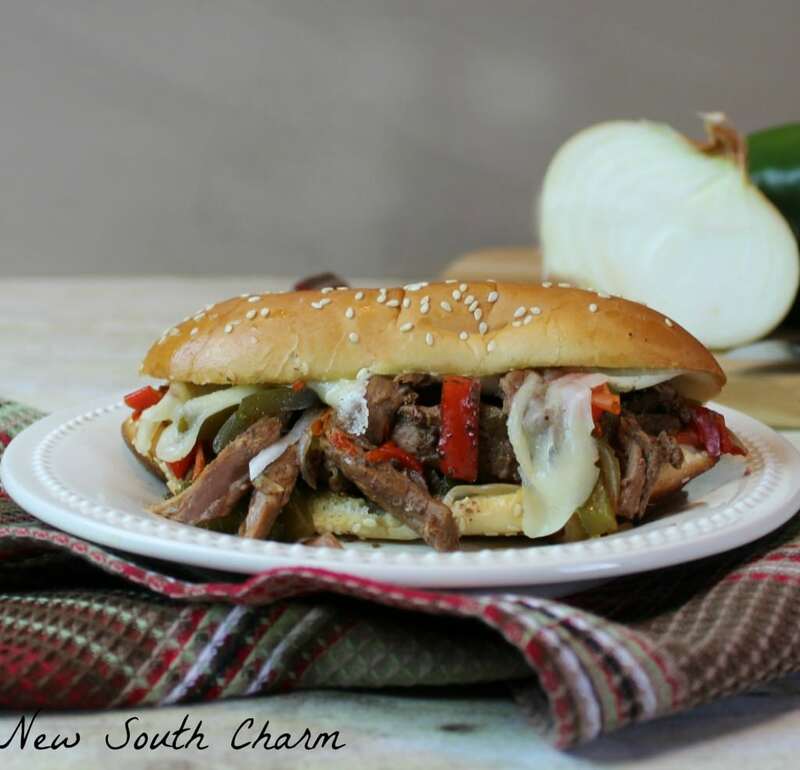 Dish up steak, onions and peppers and enjoy! This sounds wonderful! 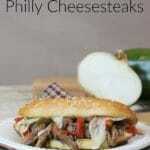 My family loves Philly Cheesesteaks! Thank you for posting. Loving this recipe. Thanks so much for joining the Dishing It & Digging It Link Party.